Dating with a disability is damn hard. There I said it. I’ve honed in on the forever complicated art of dating from a wheelchair, from finding open-minded people to handling rejection like a champ. Dating like a crazy lady in my 20’s definitely helped. Now older and wiser (I hope! 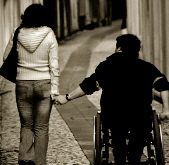 ), I’m helping other people with disabilities with their dating questions. Have a dating situation you think is impossible? Nuh-uh…I don’t believe you.